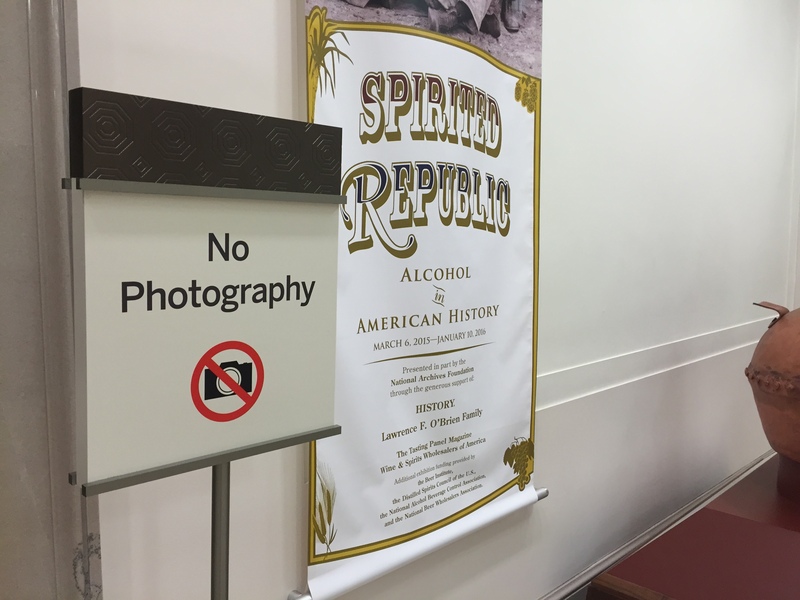 No photography allowed in the exhibits at the National Archives? Last weekend I went to see “Spirited Republic,” a temporary exhibit at the National Archives about the history of alcohol in the United States. I’m interested in the history of food and knew the Archives would dig up some interesting materials. It was a worthwhile visit but ugh, right at the entrance is a sign declaring “no photography.” This isn’t unusual for temporary exhibits because they may contain materials that are protected by copyright or have objects on loan. In this exhibit, however, everything was drawn from the collections of the Archives or had fallen out of copyright. If I went around the building to the Research Room, I could retrieve any of the items on display and make photographs without question. Secondly, most of the items are historic governmental or administrative documents, which don’t encourage selfies or other distractions. Photographs would most likely be taken by people who were really interested in the subject and wanted an image for reference. If they’re worried about light damage, people can be warned not to take flash photos (and studies by conservators show that flash photography has to reach excessive levels to cause significant damage, so this is usually an unfounded concern). If they’re worried about security, everyone has already been screened in the usual DC way and guards are posted throughout the exhibit. Finally, photography is one of the only areas of creative activity that’s growing in the US (bucking the declines in sewing, painting, pottery, or music according to studies by the National Endowment for the Arts) and the Archives has a rich trove of content for inspiration (and it helps publicize their exhibits and collections). The “no photography” makes absolutely no sense at the National Archives. Instead, the National Archives should assume that photography will be allowed unless there are specific and legitimate reasons not to do so. Just follow the same rules as in your Research Rooms. Prohibitions on photography isn’t the only stumbling block to public access and historical interpretation at the National Archives–I’m sensing a growing use of reproductions and facsimiles. I understand the need to protect documents from light damage, but it’s really getting out of control. If anyone in the nation understands the human need to see the real thing, it should be the National Archives, who displays the original Declaration of Independence, United States Constitution, and Bill of Rights in its hallowed Rotunda for the Charters of Freedom (and for an activity, instead of signing the Declaration of Independence, how about signing the US Constitution, which is far more relevant to our lives today?). Yet the first four documents in “Spirited Republic” are reproductions, clearly labeled “This is a facsimile” although displayed on mounts as if they were originals. Huh? (I would have provided a photo to show how ridiculous this looks, but I didn’t want to get thrown out by the guard.) This attitude goes to the extreme in the permanent Records of Rights exhibit, which “showcases original and facsimile National Archives documents.” Not only are most of the documents on display reproductions, but how do you showcase a facsimile? Really? Let’s rethink the value of authenticity–it lies not only in the intellectual content of the documents but also in the paper and ink, otherwise we might as well close the exhibits and just have virtual experiences (which would probably make some archivists do cartwheels with joy). Instead, the National Archives should assume that the real, authentic, and original will be displayed unless there are specific and legitimate reasons not to do so. We have to move away from the idea that a reproduction is a good as the original. If the original 1297 Magna Carta can be on display, so should the Voting Rights Act of 1965. This entry was posted in Authenticity, Collections, Emotion, Objects and tagged National Archives, Photography, Reproductions on August 4, 2015 by Max van Balgooy. I’m eager to see if anyone associated with the National Archives can provide a logical justification for this policy. The only one I can think of is when an item is out on loan or has been removed for cleaning or preservation. In both of these cases, there should be a label indicating why you’re seeing a copy, and not the original. I’ve been through my own ridiculousness with the National Archives, though it was much less substantive than yours. A few years ago I contacted the local Archives (in Waltham) to introduce them to The History List and encourage them to post their community events. There was no cost, and several other of our leading Boston institutions were already participating. What ensued was a back-and-forth in which I was asked to justify why they should use a free platform targeted at those interested in history, and it ended in them rejecting taking the, say, 3 or 4 minutes it would have taken their communications person to copy and paste their information. The reason? Because TheHistoryList.com is a .com and someone might be making some money. (I can assure you, there is absolutely no money being made, let alone profit.) And no, there was no explanation of why they had a Facebook.com page. I was actually even more interested in the sponsors listed for the exhibit – at what point does an exhibit on alcohol become a commercial, when it’s sponsored by The Tasting Panel, the Wine and Spirits Wholesalers of America, the Beer Institute, the Distilled Spirits Council, the National Alcohol Beverage Control Association, and the National Beer Wholesalers Association? jumping in late here to say how underwhelmed i was by an exhibit so rich with potential. All due respect, but archivists, don’t do this at home. Was equally dismayed by the no photo policy, but even more let down (for our field) by all the facsimiles. Treated so gingerly yet. I mentally pulled a couple out of their cases, transformed them into wall murals, and mounted them for all those poor, straining-to-see visitors. Oy.